VERONA, N.Y. (Jan. 18, 2019) — For 11 rounds, the action happened in fits and starts. Then, in round 12, heavyweight contender Oscar Rivas lowered the boom, knocking out former world title challenger Bryant “B.Y.” Jennings. 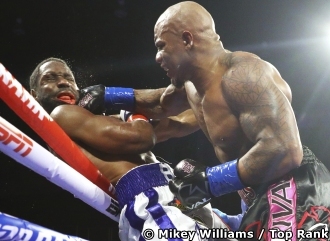 Rivas knocked down Jennings in the 12th round, then a follow-up flurry pinned Jennings against the ropes and forced referee Gary Rosato to stop the fight. At the time of the stoppage, the judges’ scorecards were as followed: 106-103 Jennings, 106-103 Rivas, and 105-104 Rivas. Rivas (26-0, 18 KOs) defended his NABF belt and picked up Jennings’ NABO and IBF International titles in the process. Jennings (24-3, 14 KOs) saw his five-fight winning streak come to an end. “I worked hard for this fight, and this is the result we were looking for," Rivas said. "Before the beginning of the last round, my coach reminded me how hard we had worked, and that motivated me to leave everything in the last round. I saw that the combination of a hook and straight right hand was landing, and I kept throwing it until I knocked him down. “I demonstrated that I’m unbeaten for a reason. Now after this triumph, the boxing world will know my name. This victory puts me closer to being among the elites of the division. I want to write my name in the history of Colombian boxing. Said Jennings: "It is what it is." 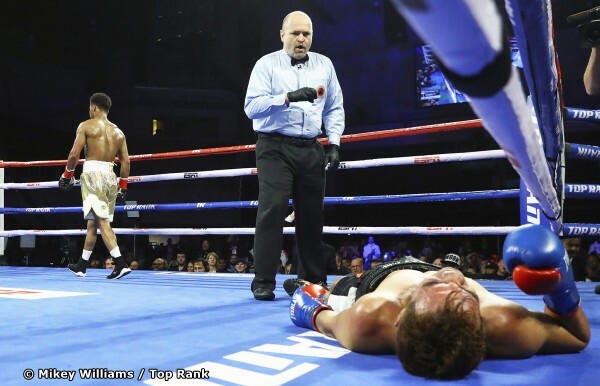 Shakur Stevenson flattens Jessie Cris Rosales. Featherweight sensation Shakur Stevenson (10-0, 6 KOs) is ready to take on the world. The 2016 U.S. Olympic silver medalist knocked out Jessie Cris Rosales (22-2-1, 10 KOs) in the fourth round to win the WBC Continental Americas and IBF Intercontinental titles, his fourth stoppage victory in his last five bouts. Stevenson knocked down Rosales in the fourth round, but Rosales rose to his feet on wobbly legs. After the fight, Stevenson called out IBF featherweight world champion Josh Warrington. “I want Warrington. I want to go England and fight in front of the fans over there. That would be a great fight," Stevenson said. “I know that I’m ready for a title shot. At the same time, I am still growing and improving. I have a great team behind me." Jason Sosa (22-3-4, 15 KOs) didn’t have an easy night at the office, but his hopes of another world title opportunity did not diminish. The former super featherweight world champion traded knockdowns with Moises Delgadillo (17-19-2, 9 KOs), ultimately prevailing via 10-round unanimous decision by scores of 97-91 (2X) and 96-92. “I came from behind in this fight. He surprised me and knocked me down with a good punch, but I recovered and then I managed to knock him down and take control of the fight," Sosa said. "I did not have any amateur fights, so I’m still learning a lot with each fight." Carlos “Caballo Bronco” Adames (16-0, 13 KOs) showed why he is one of the 154-pound division’s hardest punchers, knocking out Juan Ruiz (21-4, 13 KOs) with a single right hand to the body at 1:57 of the third round. Super lightweight prospect Fazliddin Gaibnazarov (7-0, 4 KOs), a 2016 Olympic gold medalist, broke down Ricardo Garcia, who stayed on his stool following the fourth round. Gaibnazarov scored a knockdown in the third round. "I want to step up my level of competition now," Gaibnazarov said. "I am ready for the top fighters at 140 pounds. My time is coming." Vikas "The Indian Tank" Krishan came, saw, and conquered in his pro debut, scoring a second-round TKO over Steven Andrade (3-4, 2 KOs) in a super welterweight fight. A former amateur superstar, Krishan represented India at the 2012 and 2016 Olympics. Super featherweight prospect Robson Conceicao (11-0, 5 KOs) rolled to an eight-round unanimous decision over the durable Hector Ambriz (12-9-2, 6 KOs). All three judges scored the fight 80-72.